Fly4Real is bringing Spain’s first outdoor skydiving simulator to the Costa del Sol next month and have launched a competition to win the first 10 flights. All you have to do to enter is send them an email, or fill out the contact form on their website www.fly-4-real.com before April 26. A skydiving simulator allows visitors to fly on a column of air, without a parachute. It simulates the freefall portion of a skydive, and is an addictive, exciting and thrilling experience. 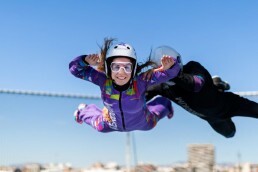 It’s the perfect way to find out what skydiving feels like without jumping from an aeroplane. Anyone can safely enjoy the thrill of flying and as long as you’re reasonably fit and healthy, age is no barrier. Located at KartCenter Campillos, under an hour from the coast, Fly4Real’s outdoor simulator is set be an exciting new addition to the area’s tourism activities. To be one of the very first people to try an outdoor skydiving simulator in Spain enter their competition to win one of the first ten flights. They are giving away ten 48,000 foot freefall flights, their recommended option for beginners who are trying out a skydiving simulator for the first time. The competition will run until the 26th of April. To enter, send an email to info@fly-4-real.com or visit the website www.fly-4-real.com. Ten winners will be selected at random from the entries, and the winners will be announced on Monday April 29 and be notified by email. Flights will be arranged in the opening week from May 1.